WCT Scholarship Award 2016 is now open for application to all Malaysians who are granted a place in our local universities. This Award is offered to help in the development, nurturing of our future talented Malaysians. 1. Good STPM result (Minimum 3As) or completed Matriculation/ Diploma level (Minimum CGPA 3.00). 2. Must have a confirmed placement to pursue a full-time degree courses at local Malaysian universities. 3. Currently not bonded or receiving any scholarship and financial assistance from any other organisation. 5. Has good command of written and spoken English. 6. Leadership qualities demonstrated through active participation in extra-curricular activities. Condition: The student shall be bonded to Company upon graduation. 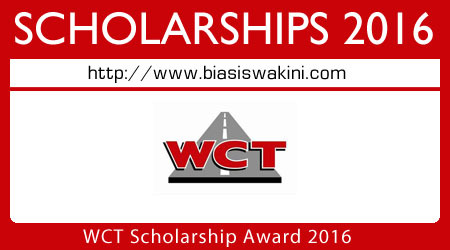 0 Komentar untuk "WCT Scholarship Award 2016"